Kane Morris died in incident at home as eight-year-old fights for her life in hospital. Tributes have been paid to a ten-year-old boy who died in a 'stabbing' at home. 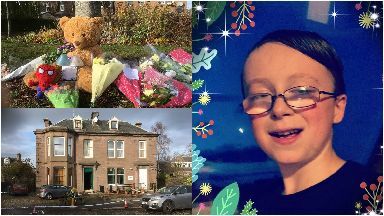 Ten-year-old Kane Morris was found dead in Union Street, Coupar Angus, around 2.30am on Sunday. 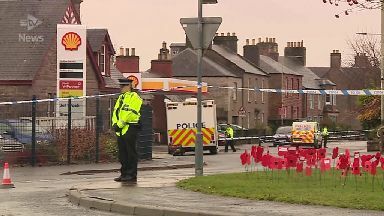 An eight-year-old girl is fighting for her life in hospital following the incident. Police said a 37-year-old man had been arrested. Along with a bunch of roses and lilies, a handwritten note read: "To Kane. I will remember you and I miss you." Friends, family and other members of the community have also paid tribute on social media. One wrote: "The town is very subdued today. What has happened is shocking. Nobody can take it in." Another added: "We are just praying the girl makes it." Police remained at the house on Monday morning as forensic officers scoured the scene. ‎"There will be a police presence at the scene for some time while we undertake our investigation and I would like to thank the local community for their patience whilst we carry out our work. "If anyone heard or saw anything in the Union Street area, who hasn't already spoken with officers, I would ask that they call Police Scotland on 101 (ref 0611 of 11 Nov) with details."